Katzenworld: New Guide Released "A Guide to Arthritis in Cats"
A detailed look at Arthritis in cats and how to prevent this disease and help those cats suffering from it. Arthritis is common in cats. Prevention is the best course of action as it can be difficult to treat cats due to side effects. It can often be difficult to work out whether a cat is suffering from the effects of arthritis as the symptoms are often restrained. A cat is not likely to walk any differently but there could be other signs that one should be aware of that could affect their mobility. Jumping may be limited and they may not want to be stroked or even brushed, even small signs such as going to the toilet in places other than their litterbox could suggest that there is an underlying medical condition. Unlike dogs, cats can be tricky when it comes to identifying painful joints. X-rays can help to pinpoint the areas but they are not always accurate. A vet will diagnose arthritis by the way in which the owner describes their behaviour as well as any other symptoms. 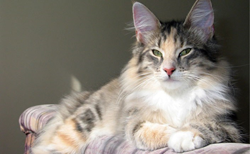 Treating a cat for arthritis can be difficult because some drugs can lead to problems. Therefore, all drugs administered should be registered for use in cats and the exact dosage has to be given. The most common on the market are Metacam 30ml oral suspension and previcox 227mg tablets. There are a number of things one can do to help minimise pain in order to make them more comfortable. If a cat is overweight then losing weight can help to reduce pressure on the joints. Any weight loss should be slow because a rapid weight loss can lead to other problems such as hepatic lipiodosis which can be troublesome. To ease some of the symptoms, it's best to consult a vet. They can prescribe pain relief which helps to take away the inflammation in the joints to make a cat more comfortable. Acupuncture can also help as this can ease pain without causing any side effects. For the full story please head over to the Katzenworld online magazine.